Many people equate pumpkins with the beautiful fall season, but most people are more used to them as intricately carved decorations than a delicious part of any meal. 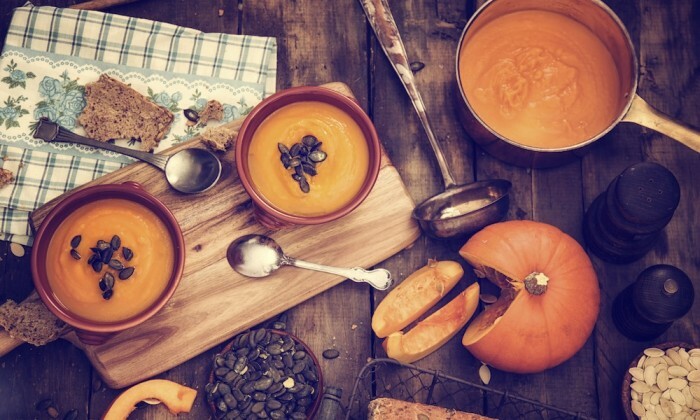 The truth is that pumpkins are incredibly nutritious. My favorite nutritional aspects to pumpkins are high concentrations of the vitamins A and E, pigments like beta-carotene and high amounts of fiber. A single serving of pumpkin contains more than the daily requirement of vitamin A, which has been associated with eye health and preservation of night vision. Pumpkin seed oil can help lower LDL cholesterol (the bad one) and also contains vitamin E, which is necessary for good skin health. The increased fiber content and low caloric intake in one serving of pumpkin aids intestinal function, keeps you fuller for longer and can be incorporated into a healthy weight loss plan. Finally, the red-orange pigment beta-carotene has been linked with anti-cancer properties. Everyone is familiar with pumpkin pie, but there are a variety of other ways to enjoy this delicious vegetable. What are some of your favorite ways to serve this healthy fall delicacy to your guests?